The Australian Chopperoos team has unveiled the green and gold jerseys they will don when they take on the rest of the world at the 2018 STIHL TIMBERSPORTS® World Championships in Liverpool, England on October 20 & 21. 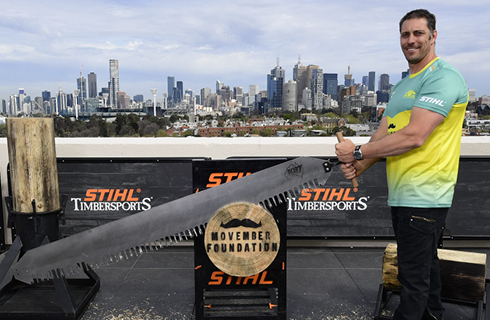 The front of the jersey features the logo of the Chopperoos’ official charity partner, The Movember Foundation, to raise awareness of men’s health on the world stage, as they compete with razor sharp axes and high-powered chainsaws against 24 countries in a series of extreme wood chopping and sawing disciplines. The international competition series will see the Chopperoos fighting for Australia’s fifth team world title, competing across four thrilling axe and saw disciplines in the team relay against top nations including England, Germany, New Zealand and the US. 2018 STIHL TIMBERSPORTS® Australian Champion Laurence O’Toole from Victoria will be fighting to be crowned the Individual World Champion for the first time. The Chopperoos will be led by four-time world title winner and captain Brad De Losa (NSW), and rounded out by Brayden Meyer (VIC), Glen Gillam (VIC), Jamie Head (QLD) and 2018 Rookie Champion Josh Bakes (TAS). 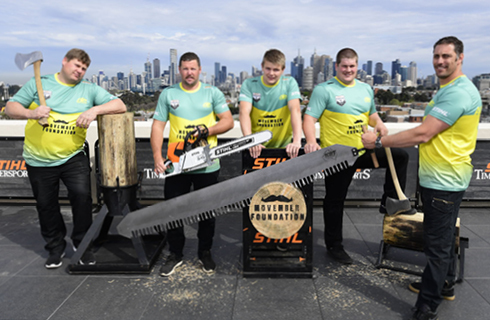 In fact, the Chopperoos are one of Australia’s most successful sports teams of the modern era, winning three of the last four STIHL TIMBERSPORTS® Team World Championships. Chopperoos captain Brad De Losa said he is excited about the quality of the team and is confident they will deliver a strong performance. "We have an exceptionally strong team this year and we’re ready to head over there to try and win Australia’s fifth team world championship," Mr De Losa said. "Laurence will be a real contender in the Individual Championship, but he has a big task ahead of him going head-to-head with New Zealand champion Jason Wynyard, who was nine world championships under his belt." The sport has a 100-year-strong history in Australia, where workers in the timber industry would hold competitions to determine who was the fastest in a range of wood chopping and sawing disciplines that closely simulated their everyday work. Known as the ‘Original Extreme Sport’, the STIHL TIMBERSPORTS® World Championships will be held at Echo Arena in Liverpool, England on October 19 & 20 (20 & 21 AU). To livestream the action from 5am-9am on Saturday 20 and Sunday 21 October, head to www.facebook.com/stihltimbersportsAUS.